Above: Family. 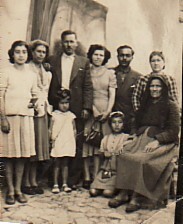 L-R: his sister,Maria; Maria From Napi); his brother, Paraskevas- with Ioanna (child); his sister, Stella- with her husband, Vasilios Saltas; Efstratia (child); my wife, Eleni; and my mother, Vasiliki (seated). 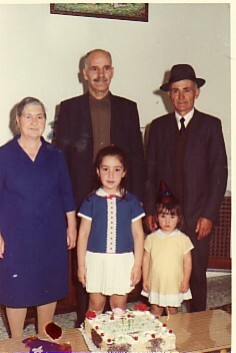 Above Right: With my wife, Eleni, and our daughters, Maria and Efstratia. 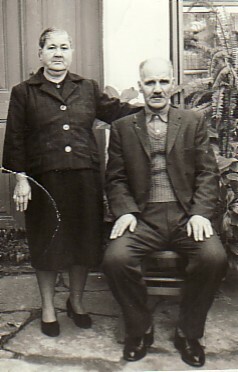 Above: With his wife, Eleni. 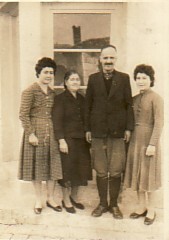 Above Right: With his wife, Eleni, grand-daughters, Maria and Eleni, and sybethero, Fokiou Koresis.